Spread outside of sandwiches with butter. 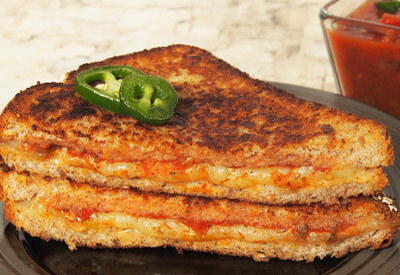 Place cheddar cheese slices on the inside of 4 slices of bread. Spread each with about 2 tablespoons salsa. Top with Monterey Jack cheese slices and remaining slices of bread. Heat 12-inch skillet over medium heat. Place sandwiches in skillet and cook 2 to 3 minutes on each side or until golden brown.